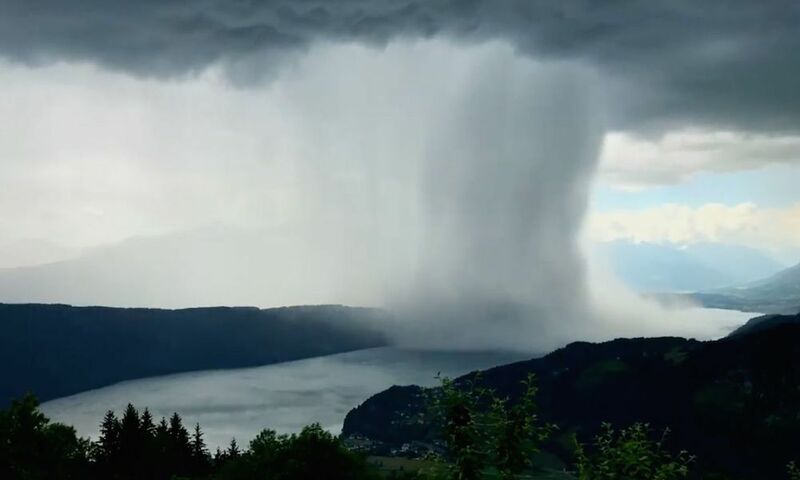 An amateur Swiss photographer has captured extraordinary footage of a cloud emptying its contents in one huge short burst. The incredible video shows rain in a whole new way. 27 year old Peter Maier recorded the time-lapse footage of this freaky weather event, from his hotel balcony while on holiday at Lake Millsatt in Austria<. Peter said witnessing the event was like watching a “tsunami from heaven.” This incredible storm moment, that looks like a God pouring a huge bucket of water over the landscape, is known to meteorologists as a "wet microburst“, which sounds a lot less impressive than the actually strange phenomenon. The rain bomb, as it is also sometimes called, is a rare weather event but with the proliferation of social media more and more of these spectacular natural events are being captured on camera, so that we can all enjoy our strange and beautiful planet.